GEMMS is a group-sourced online bibliographic database of early modern (1530-1715) manuscript sermons from the UK, Ireland and North America. This blog includes project updates, reflections on our work and profiles of manuscript sermon collections. This blog post marks a significant milestone for the GEMMS research project. With well over five thousand sermons now entered into our online bibliographic database, this post shines a spotlight on GEMMS sermon # 5555. This sermon illustrates the broad scope of the project, which encompasses not only manuscripts from the British Isles, but also many fascinating records of preaching from the North American colonies. Sermon # 5555, and the wider collection to which it belongs, offers a rare glimpse of preaching in early Newfoundland, which would become part of Canada more than two centuries later in 1949. During the early eighteenth century, the Anglican clergyman, Jacob Rice (1683-1728), served as minister of St John’s, Newfoundland. The son of Thomas Rice of Newcastle, County Cardigan, Wales, he matriculated at Jesus College, Oxford, on the 13th of March 1699/1700 aged seventeen and received his BA from Magdalen Hall on the 16th of March 1703/4. Later that year he returned to Cardiganshire to take up a curacy, but in 1705 he was appointed as missionary at St John’s to replace John Jackson, who had served as chaplain to the British garrison since 1701. A letter of royal appointment by Queen Anne, dated May 1705, survives amongst Rice’s scribal remains. This document declares that Rice was ‘to be Chaplain to the Garrison or Garrisons’ in Newfoundland. A further surviving letter of appointment by the Bishop of London, dated the 3rd of June 1705, states that ‘Jacob Rice Clerk’ was ‘to be admitted to the Ministerial Function in the Province of Newfoundland in America’, having vowed to ‘conform to the Liturgy of the Church of England’. On account of his failure to provide the necessary testimonials prior to his departure for Newfoundland, Rice failed to receive any financial support from The Society for the Propagation of the Gospel. After residing at St John’s for a number of years, Rice relocated to serve as chaplain to the English garrison at Placentia. Unfortunately, the exact year of this transfer remains uncertain; Rice was still living in St John’s in 1712, but by early 1725 he appears to have taken up an appointment as Rector of North Cray, Kent, England. On his death in September 1728, Rice left £10 to his female servant and the remainder of his estate to his niece, who acted as sole executrix of his will. Figure 1: Letter of appointment by the Bishop of London. © The Bodleian Library. MS. Rawl. E. 173, ff. 18v-19r. 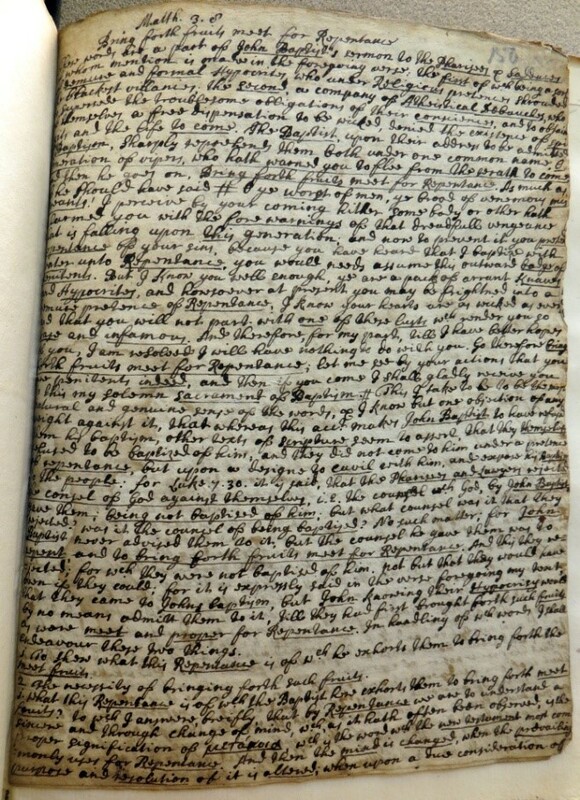 Two volumes of Jacob Rice’s early eighteenth-century sermons survive in the Bodleian Library, Oxford, as manuscripts Rawlinson E. 173 and Rawlinson E. 174. 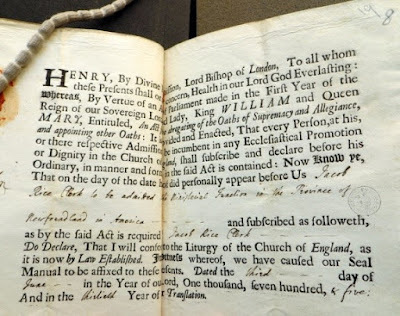 The first volume contains thirty-three separate sermon entries, six of which bear dates ranging from the 4th of April 1705 to the 23rd of May 1706. Only one sermon, preached on 1 Corinthians 11:29 (‘He that eateth and drinketh unworthily, eateth and drinketh damnation to himself, not discerning the Lords body’), is explicitly identified as having been preached at St John’s on the 10th of February 1705/6. On this occasion, Rice’s intention was to educate his congregation concerning exactly ‘what is required of them who come to the Lords supper’ (MS. Rawl. E. 173, fol. 198r). Alongside a number of funeral sermons, this volume also contains a sermon on Joel 2:18 (‘then will the Lord be Jealous for his Land, & pity his people’) which was preached at a fast on the 4th of April 1705. According to Rice’s text: ‘the Government upon this day commands upon pain of such punishment as it may justly inflict’ that all must ‘sanctify a fast’ in accordance with their duties ‘as Englishmen and Protestants’ (fols. 183r-188v). 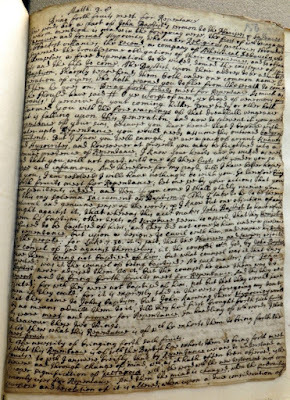 The second volume of Rice’s sermon manuscripts contains another thirty-three entries. One of this number, preached on Proverbs 10:9 (‘He that walketh uprightly, walketh surely’), is dated the 4th of November 1705 and is identified as ‘the first sermon I preacht at St Johns’ (MS. Rawl. E. 174, fol. 209r). Twelve further entries in this collection bear precise dates, ranging from the 11th of November 1705 to the 4th of August 1706. Nine of the sermons are said to have been preached at St John’s, but Rice also preached at Portsmouth, Gosport and Stoke during August 1705. Again, a number of the entries in this collection are funeral sermons, including one that was preached at the funeral of a merchant, Mr Yeates, on the 3rd of July 1706 (fol. 89v). There are two interesting instances of the same funeral sermon being preached on the deaths of more than one individual, and there are also three clear examples of occasions on which Rice preached two sermons on a particular text on the same date. For example, he seems to have preached on the divine inspiration of Scripture (according to 2 Timothy 3:16) on both the morning and afternoon of a single day (fols. 185r-190v, 191r-196r). One of Jacob Rice’s sermons is GEMMS sermon # 5555, which spans folios 216r-218r of his first volume of sermon notes (MS. Rawl. E. 173). It was preached on the 23rd of May 1706 at the funeral of a woman named Hannah, the wife of Mr [John?] Mitchell. On this solemn occasion, Rice chose to preach on Matthew 3:8 (‘bring forth fruits meet for Repentance’). This verse forms part of a speech which John the Baptist addressed to the Pharisees and Sadducees who witnessed him baptizing in the river Jordan. Rice began by outlining his interpretation of this Biblical narrative, observing that these Pharisees and Sadducees (a ‘brood of venemous miscreants’), alarmed by forewarnings of ‘dreadfull vengeance’ awaiting their generation, feigned repentance and sought out John’s baptism by water. They desired this ‘outward badge of penitents’ despite lacking any true desire to turn from sin. According to Rice’s interpretation, John refused them baptism on account of their hypocrisy, but offered assurance that this ‘sacrament’ was freely available to all who demonstrated true repentance by their actions. Figure 2: Beginning of the funeral sermon for Mrs Hannah Mitchell. © The Bodleian Library. MS. Rawl. E. 173, f. 216r. On the basis of this Scriptural account, Rice sought to illustrate two points of doctrine; first, ‘what this Repentance is of which he exhorts them to bring forth the meet fruits’ and, secondly, ‘the necessity of bringing forth such fruits’. Rice defined repentance, or μετάνοια, as ‘a sincere and through [sic] change of mind’, a willful resolution to leave off vice and forsake a sinful course of life. This, Rice insisted, is necessary for ‘the satisfaction of God’, since it is on account of the merits of Christ’s death that our repentance is accepted in lieu of our punishment. Only a repentance which bears fruits that lead to personal amendment and to the amendment of others can be acceptable to God. Moreover, these fruits of repentance are essential for ‘the satisfaction of our own consciences’, providing a comforting reassurance of the sincerity of our penitence. She had the misfortune to be brought [to Newfoundland] by sectaries which kept her from the common advantage of a X.tian, which by reason of her modesty which I presume had got a little the upper hand of her she never imparted to me till she lay on her death-bed, where she received the b[enefit]e of Baptism. had live[d] a considerable time in this countrey without addicting her self to those vices (shame on them) that seem by its so common use to be peculiar to the place, she being a modest, sober, chast, quiet woman, & I hope she has her due reward in Heaven. Figure 3: End of the funeral sermon for Mrs Hannah Mitchell. © The Bodleian Library. MS. Rawl. E. 173, f. 218r. only hope that God who has shewn mercy in midst of Judgment to many & great sinners has in his great and most condescending Pity received our deceased Brother into his eternal Rest (MS. Rawl. E. 173, fol. 25r). Jacob Rice’s extensive collection of sermons constitutes a fascinating window onto the style and content of early eighteenth-century Anglican preaching. These manuscripts supply some evocative insights into the condition of the Anglican Church in Newfoundland in this period and the pastoral approach of missionary preachers. The GEMMS team are eagerly awaiting the launch of our online bibliographic database in spring 2017 when these, and many other early modern British and North American sermon manuscripts, will become more easily accessible for researchers. All images reproduced with the kind permission of the Bodleian Library. Alumni Oxonienses: The Members of the University of Oxford, 1500-1714..., vol. 3, edited by Joseph Foster (Oxford, 1891), p. 1250. Carson I. A. Ritchie, ‘Rice, Jacob,’ in Dictionary of Canadian Biography, vol. 2 (University of Toronto/Université Laval, 2003) http://www.biographi.ca/en/bio/rice_jacob_2E.html (accessed October 12, 2016); Geoff Peddle, ‘The Reverend Jacob Rice: Anglican Ministry and Preaching in Early Eighteenth Century Newfoundland’, MA thesis (Memorial University of Newfoundland, 1996), pp. 9, 15, 20. Bodleian Library, MS. Rawl. E. 173, fols. 10v-11r, 18v-9r. Ritchie, ‘Rice, Jacob’; Peddle, ‘The Reverend Jacob Rice’, pp. 22-5. Ritchie, ‘Rice, Jacob’; Peddle, ‘The Reverend Jacob Rice’, p. 26; Falconer Madan, A Summary Catalogue of Western Manuscripts in the Bodleian Library at Oxford..., vol. 3 (Oxford, 1895), p. 273; The National Archives, PROB 11/624/333. Peddle, ‘The Reverend Jacob Rice’, p. 100. Background Photo by: Beinecke Flickr Laboratory. [Two page opening including sermon on Exodus 20.17], in [Sermons], 1655 Jan-Jul., MS Osborn b362, James Marshall and Marie Louise Osborn Collection, Beinecke Rare Book and Manuscript Library, Yale University. © GEMMS and respective authors, 2015-2017. All Rights Reserved. Simple theme. Powered by Blogger.